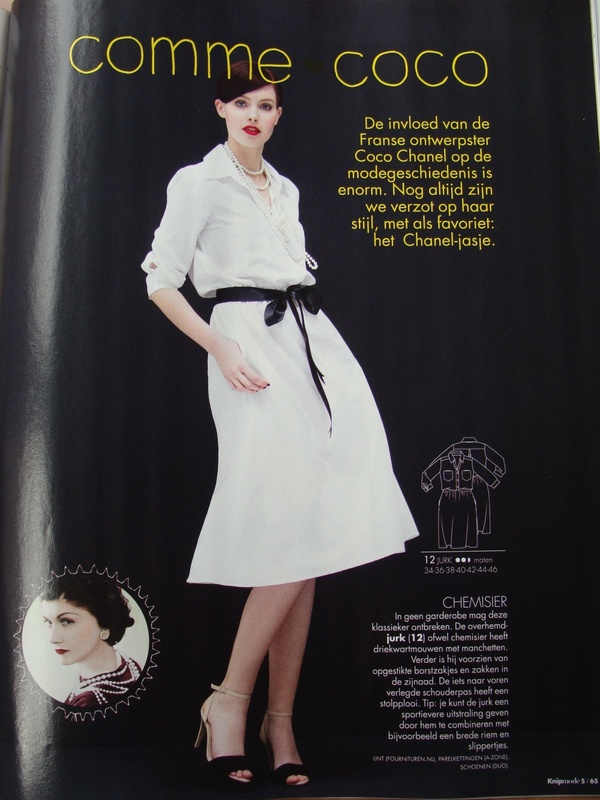 From the Brigitte Bardot section: by far my favourite dress from this issue! I’m definitely making this for the summer. Yesterday I found my first issue of Knipmode in the mailbox. It was an impulsive decision to get a subscription, because I haven’t been interested enough to buy it in the shop for the past few years. But lately I’ve found myself wanting to sew but not go through the whole ordeal of drafting things myself and the back issues I have are just not that shiny anymore. So there it is, a year’s subscription to Knipmode. I’ve sort of set myself the challenge to make at least one thing from each issue, hopefully before the next one arrives, but with all the (sewing) homework and secret projects I’m not sure how reasonable that is. Anyway, this first issue makes me happy I got the subscription, because there’s quite a few things I’d like to make! The issue has “Style Icons” as a theme, and features clothing inspired by Kate Moss, Brigitte Bardot, Jackie Kennedy, Coco Chanel, Caro Emerald and almost-queen Máxima. It also has an extra mini-magazine with easy “holiday fashions”, but I didn’t photograph a single one of them because they’re basically all variations on bags with or without belts. There’s one pair of trousers that could make nice pajama pants, I guess. Anyway, I’m quite happy with this issue and I hope that the coming 11 will be just as nice. Here’s my selection from this issue, as you had probably guessed my picks come mainly from the Bardot/Kennedy/Chanel sections! Another BB inspired one. The skirt is quite cute. Apparently the shirt has a low cut back, but none of the 5 versions in the magazine show the damn back. WHY!? Also Chanel. I’m not yet 100% sure on this dress. It looks gorgeous and flowy, but also perhaps a bit too loose just above the waist. You’d need a very lightweight fabric. One of the 4 plus-sized patterns inspired by singer Caro Emerald. Cute, simple jersey wrap dress. The one on the picture looks a bit different from the tech drawing though. Also, if the detail of the dress is around the waist, why does the model cover it with her hands? Jackie Kennedy. Very elegant, especially with the bow. I’d probably lower the neckline a little bit though. Last and most definitely least, this one is a definite nope. Probably the worst piece in the magazine. Máxima usually looks quite nice, but what is up with those random squares? Exactly – 6ish euros for even one great pattern isn’t all that much. Which is why I figured a subscription would be worth it in the end :) This issue will definitely be worth it’s price, even if I only make half the things I like!